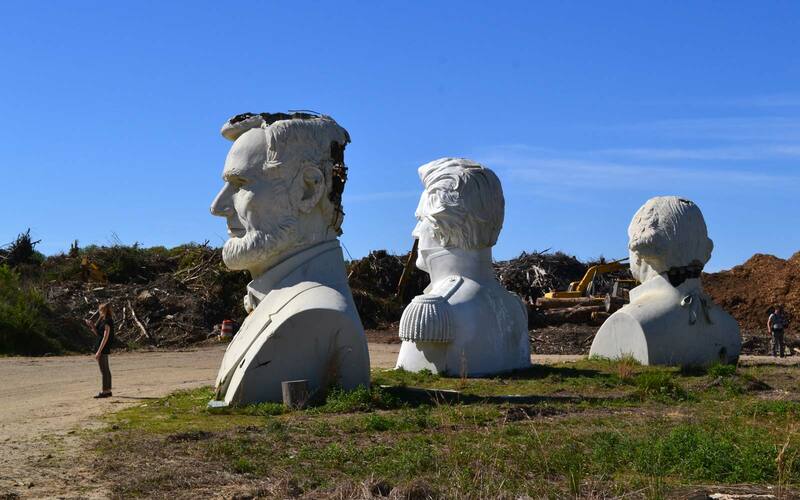 Retired from a Williamsburg theme park, 43 giant presidential heads await their second act. 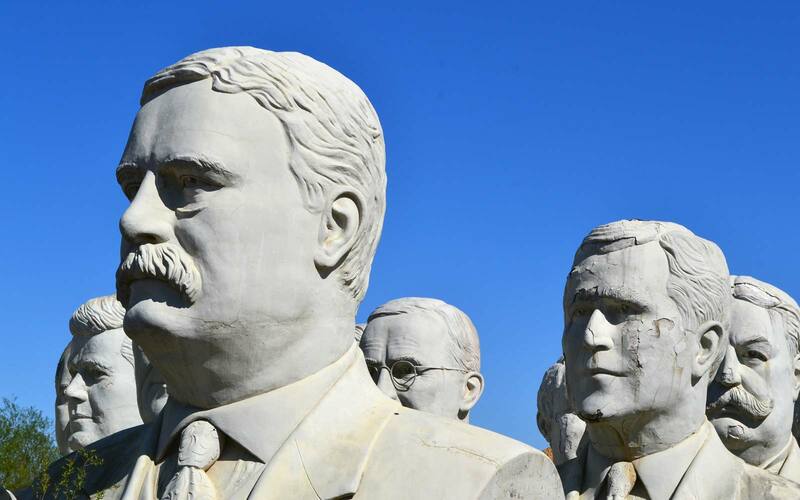 Up ahead, colossal busts of the first 43 American presidents – each one nearly 20-feet-tall and somewhere between 11,000 and 20,000 pounds of concrete and steel – rise from the dirt, skirted by weeds and wood chips. Teddy throws shade on Harding, Harding on Carter, Carter on Hoover. A knot of rebar sprouts from FDR’s forehead. William Henry Harrison looks like he just crawled home from a bar fight: bruised face, cracked chin, cut above the eye. Lincoln still cuts an imposing figure, though an ironic five-foot-wide hole in the parietal exposes a hollow, mangled frame. And what of poor William Taft? He quietly weeps, a single water stain trailing from eye to cheek. Far from chintzy, the busts are so lifelike, so detailed, one could easily picture them waking up at any moment and holding congress. Today, CMT’s Southbound travel series is on location to shoot a segment for its episode on coastal Virginia. Hankins keeps an eye on the six-man crew as they survey the shot, snaking their way between the busts, gathering B-roll and room tone. In a few minutes, the PA will return to mic him up, and the host – in this case, former Miss Tennessee Allison DeMarcus – will initiate small talk before the camera rolls. He knows the routine. Over the last three years, as word of the busts’ fate cracked the national circuit – the surreal dissonance between the presidents’ stature and their lackluster environs too novel to ignore – media presence at Hankins’ farm has grown commonplace. And despite several “Keep Out” signs posted prominently at the head of the half-mile jog off Route 607, daring tourists continue to visit the heads, well aware now of their unlikely presence. Enter “president heads” in Google Maps and you’ll find yourself staring at the heads from above, surrounded by empty fields and the solid green fairways of the 18-hole Kiskiack Golf Club, to whom Hankins once sold 172 acres of his property. 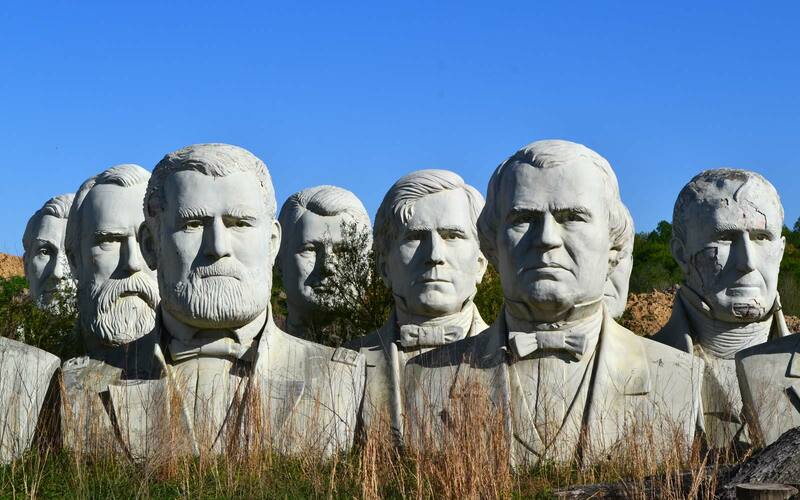 The heads, appraised at $100K each ($4.3 million total) were originally displayed at Presidents Park, a ten-acre facility behind a Williamsburg motel off I-64. The park opened in 2004, a joint venture between the sculptor and a co-owner of the motel, but poor attendance and a sluggish economy – to say nothing of the historical town’s aversion to what it saw as a low-brow roadside attraction – dogged the venture. Just three years later, in 2007, manager Everett Newman III listed the property for sale, heads included. By September 2010, the park had closed. When the new owners defaulted on their loan, the bank foreclosed on the property, assessed at $2.1 million, and two public auctions failed to attract any suitors. Concerned the busts were blocking sale of the property, Newman eventually asked Hankins, whom he originally contracted to build the park, to tear them down. Instead, with Newman’s permission, Hankins spent a week and nearly $50K lifting the heads onto flatbed trailers and trucking them to his farm, hoping he’d eventually find them a new home. "My plan is a real White House, actual size, with tours, a ballroom—every event the White House has, I’m going to have it,” says Hankins, whom many have credited with preserving a landmark. "I’m going to have a mini White House, too, with Secret Service training in there for kids, and they’re going to come in and play laser tag after they get trained to protect the president. I’m going to have re-enactors for all the events. If they have the turkey thing I’m going to have the turkey thing. When they do the Easter egg hunt I’m going to do one." The heads, of course, would accompany all this. But so far, this new park is merely hypothetical. He’s still scouting locations, soliciting investors – including Republican presidential nominee Donald Trump – and he’s reluctant to give many specifics, all of which make his plans feel, if not totally farfetched, incredibly ambitious and more than a little eccentric. Lost in the narrative of the heads, however, in the shadow of their own peculiarity and Hankins’ grand plans for their future, is 89-year-old David Adickes, the world-renowned artist who created them. Less than a year ago, well after they’d been relocated, a friend sent him a link to a story on the heads, the first he’d heard about the current status of his work. In 2002, he displayed his first set of presidential heads in Lead, South Dakota, complete with informational placards for every commander in chief. In retrospect, Adickes says, the first park was a mistake. Too much snow in the Black Hills, the window to enjoy the park too short. Today, the park is closed, though he still owns the 52-acre property, and he’s started a program to sell off the heads individually to communities that correspond with each president. Eisenhower, for example, now resides in Dennison, TX, where he was born, and Andrew Jackson is now in Jackson, MS.
That Adickes is “really old, and I hear dying,” is the extent of Hankins’ knowledge of the sculptor. 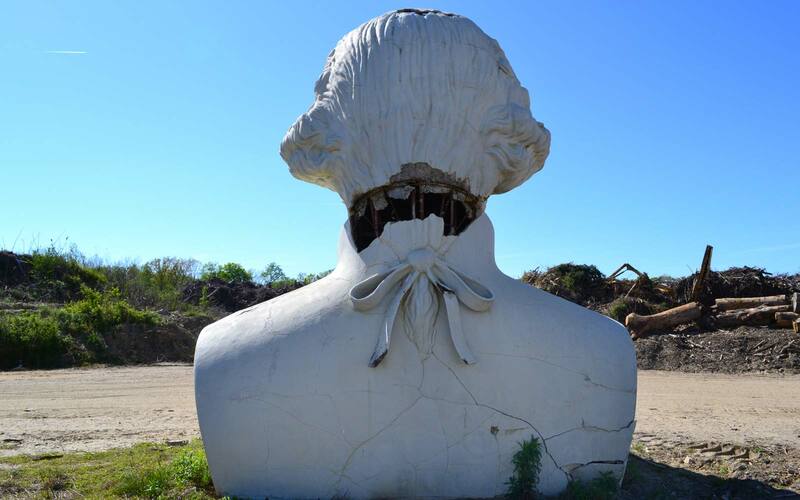 Neither Hankins nor anyone else in Williamsburg informed Adickes about the crumbling status of his work – both literally and metaphorically – nor did they ask for his advice on how to move the busts in the first place. If they had, he would have told them to drill a small hole, just two or three inches, in the top of the head, and then to loop a nylon strap through the rebar underneath. It’s how he moved them all to Williamsburg in the first place, without any damage at all. For the time being, the heads will remain on Hankins’ farm, more than four million dollars – the work of an acclaimed sculptor – resting in plain sight, exposed to the elements, to the wind and the rain and the sun, and to all those curiosity seekers undaunted by his warnings to keep out. Allison DeMarcus heads toward the truck. Hankins steps out. It’s call time, again, for the presidents’ keeper.